Increasingly, Americans require a broadband internet connection to live, work, and interact with the world around us. A broadband connection and the ability to use it are increasingly important to how individuals participate in society, access health care, obtain education, and build careers. Yet far too many individuals — including many in underserved communities — lack the skills and technology needed to effectively use the internet, and the tools and services it has to offer. That’s why I’m proud to introduce the Digital Equity Act — a new bill that would help connect students, workers, and families with the tools and skills they need to succeed in our rapidly-evolving, increasingly connected world. We know that digital exclusion carries a high societal and economic cost, and exacerbates existing wealth and income gaps in our communities. That means absent intervention, many people — especially communities of color, people with disabilities, low-income households and rural communities — are at risk of being left behind. We must act now to close the digital skills gap in our communities. Recently, during a tour of the Tacoma Public Library in my home state of Washington, I saw the digital divide up close and how community leaders and residents are stepping up to offer digital inclusion programs and training to fill the void. At the library, staff were available on-site to assist, teach, and guide residents on a range of tools — from a state-of-the-art audio engineering lab and computer skills room, down to baby toys that introduce our youngest learners to coding and sequencing. During my visit, I met with constituents who told me about the importance of having access to those tools and teachers in their community, and how it helped them achieve their personal and professional goals — from completing an award-winning student film, to finishing a Microsoft certification course that opened up new employment opportunities. I also heard from community leaders who stressed how much more they could do to promote digital equity in our communities with the proper resources and support. That’s why I — along with a group of my Democratic colleagues in the Senate — introduced the Digital Equity Act this week, and will be working with our partners in the House, and allies across the nation, to get it passed and signed into law. 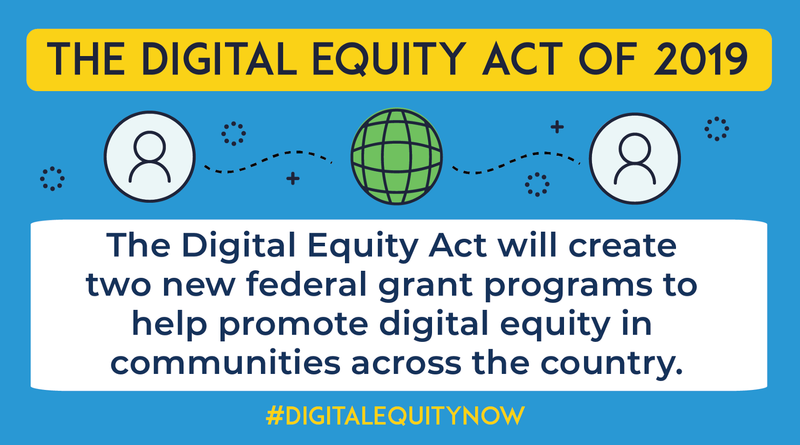 The Digital Equity Act will create two federal grant programs to help promote digital equity and support digital inclusion programs in communities across the country. It will help ensure our communities — especially those that have been historically overlooked — don’t get left behind in our rapidly-evolving, technology-driven society. During a recent stop in Tacoma, WA, Senator Murray visited the main branch of the library to see firsthand how communities are stepping up to help close the digital divide for students, workers and families. 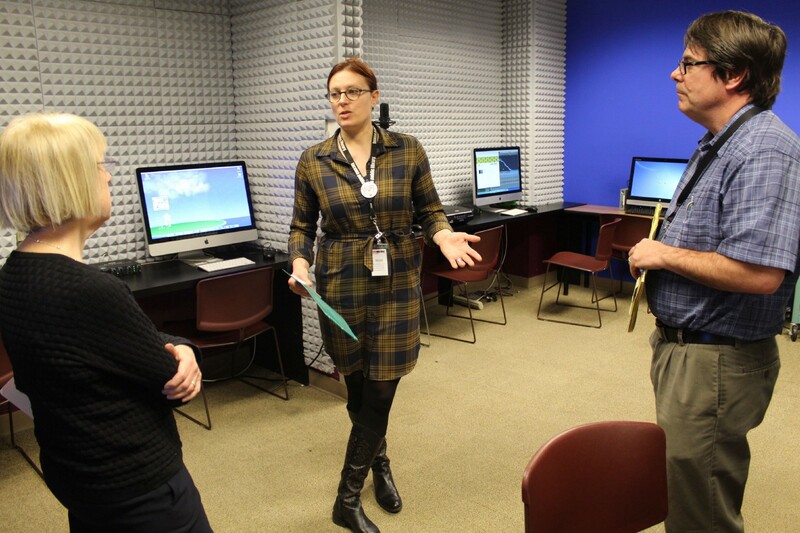 During her tour, Senator Murray chatted with Tacoma Public Library personnel about their digital inclusion efforts, including a state-of-the-art audio engineering lab that gives local residents access to instruction and industry-standard equipment that would otherwise be inaccessible for many working families. Though it remains a critical need, I believe that it is not sufficient for Congress to only invest in broadband development. We must also invest in the students, families, and workers that will use that connection. That means making sure that individuals and communities have the tools, the skills, and the support they need to fully take advantage of a broadband connection when they have access to one — and when they lack access to a reliable broadband connection, to provide the resources and technical assistance necessary to help them get connected. Put another way: it is not sufficient to only invest in building roads and highways — a highway isn’t much use without having access to a car, or knowing how to safely drive. In 2019, we shouldn’t be a country of haves and have-nots when it comes to using the internet — and Congress should be a partner in helping our states, counties, schools, and more close the digital divide. The Digital Equity Act is the right thing to do for families, and it is the right thing to do for our economy to make sure everyone is reaching their full potential. Join me, and let’s get this done for our communities. For more information about the Digital Equity Act of 2019, visit HERE.